A new era is about to begin in Vancouver. The problem is, it might not look much different from the end of the last one. With the Sedins now officially retired, it’s the dawning of a new age for the blue and green. This is now Bo Horvat and Brock Boeser’s team, and they will look to gradually lead the Canucks back to contender status. You can bet the house that won’t happen this season. The Canucks are bringing back the same defence that got torched last year, along with the same netminders. 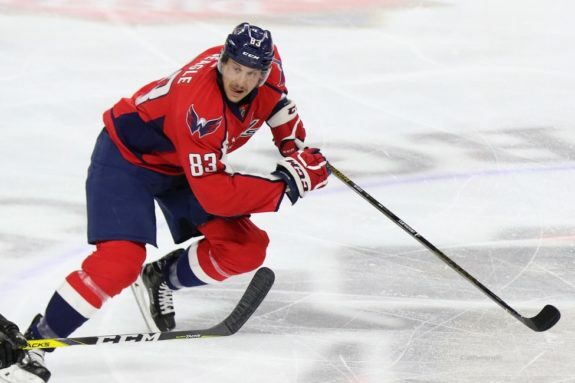 They got tougher yet slower in free agency with the additions of Jay Beagle, Antoine Roussel and Tim Schaller. One of the organization’s saving graces will make his debut this year, and he promises to be a special player. Watching the super rookie might be one of the only reasons to tune into Canucks games this year. While these season previews are always fun to write, the same can’t be said about watching Canucks hockey on most nights. 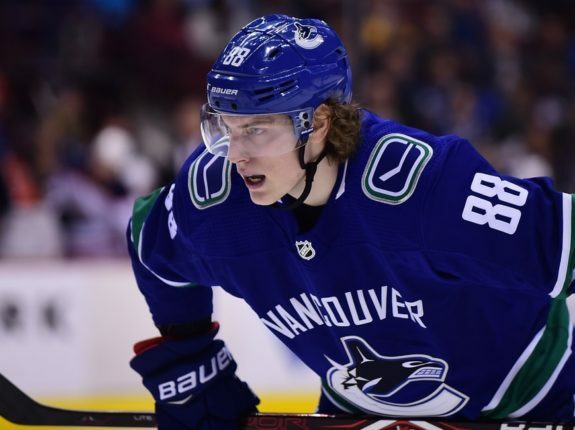 Bring on Boeser and bring on Elias Pettersson, because the rest of the team is engulfed in question marks and uncertainty. Just to make sure people hadn’t forgotten about the Canucks, they made sure to drop this bombshell on July 25th. Late on that Wednesday afternoon, the team announced that they were “amicably parting ways” with franchise legend and team President Trevor Linden. The move seemingly came out of nowhere, and in the weeks to follow more information came out about why Linden left. The overarching storyline here is that Linden was preaching patience for a rebuild, while owner Francesco Aquilini and Jim Benning wanted to speed things up. That’s a scary notion for Canucks fans, but it somewhat explains why Benning signed three aging bottom-six guys in free agency (even if the term still doesn’t make sense). Other organziational moves pale in comparison, but there were some other minor changes. Doug Jarvis, the remaining coach from the Willie Desjardins era, moved into an advisory role for the team. Goaltending coach Dan Cloutier was shuffled to director of goaltending, and former Canucks goalie coach Ian Clark returned to the fold as the full-time goaltending coach after a seven-year stint in Columbus. Well if there’s one silver lining, at least the Canucks found themselves a first line before the Sedins called it quits. You could spark a healthy debate about Horvat being a legitimate first line centre, but his line was clearly the leader for the Canucks last season. Once Horvat went down with injury on December 5th, the Canucks went from the fringe of the playoffs to the bottom of the standings. When the team went 4-12-2 in Horvat’s absence, the only Canuck you could find consistently was Boeser. He scored eight of the team’s 25 goals in the first ten games after losing Horvat. Boeser finished as the Canucks leading scorer, despite playing in only 62 games. Sven Baertschi should get a look there with them to start after the trio was solid at even-strength through the first two months of last season. Pettersson, the Canucks’ beacon of light at training camp, will begin the season as the second line centre. Who plays beside him is still a mystery, but don’t be surprised if both Brendan Leipsic and Nikolay Goldobin get a look there. Even though Pettersson was the only Canucks to perform above average, Leipsic and Goldobin both had their flashes in preseason. Will Travis Green run with an all-kids line, or will Loui Eriksson get a shot there? If we’re basing these lineups on preseason performance, there’s no chance that Eriksson slots ahead of Leipsic or Goldobin. The six-million dollar man should find himself on a checking line with Brandon Sutter to start the season. Travis Green keeps asking about where the goals will come from, and that shouldn’t be all on the kids. Eriksson and Sutter have eight 20-goal seasons combined. Markus Granlund had 19 in 2016-17, can he rebound this season? Jake Virtanen didn’t do anything to establish his presence during the preseason, so my guess is that he begins on the fourth line with Schaller and Beagle. You could really picture Virtanen anywhere in this lineup. He has the ability to play his way up to the second line alongside Pettersson. You could also see a scenario where Green pairs Virtanen with Horvat and Baertschi, while Boeser joins Pettersson on a line. Dare to dream. First of all, Virtanen has to earn a consistent spot in the lineup. The Canucks aren’t payingRoussel $12 million to sit in the press box (even if they are paying Sam Gagner more than $6 million to play in the minors). Tyler Motte also looked good during training camp, and Virtanen could just as easily find himself out of the lineup if he’s not noticeable. After Erik Gudbranson re-signed with the Canucks in March we asked ourselves: the Canucks couldn’t come back with the exact same defence two years in a row, could they? They could have, and they did. Yes, the same defence that scored a combined 21 goals last season and allowed the sixth-most goals league-wide returns for redemption. Out of everyone on this blueline, Troy Stecher performed best in the preseason. For the second season in a row, his play was arguably the biggest bright spot on this defence. He’s reliable in his own zone and an underrated penalty killer, but he could bring more on offence. Stecher likely knows that, and he was visibly joining the rush more int he preseason. It didn’t result in goals, but at least he looks like a player hungry to give more offensively. He should slot alongside Alex Edler, the highest-scoring Canucks defenceman from last season. The more prominent question with Edler is, will this be the year he waives his no-trade clause? He’s refused to waive it in the past, but if the Canucks choose not to re-sign him, then he could be saying goodbye at the deadline. However, it’s just as likely that management extends him beyond this season. Ben Hutton is still on the team, and he could start the season beside Chris Tanev on the second pairing. He could also start the season in the press box after a so-so preseason. 2017-18 was disastrous for Hutton, but he generally played well with Tanev. This is a make-or-break-it year for Hutton in the last year of his contract. 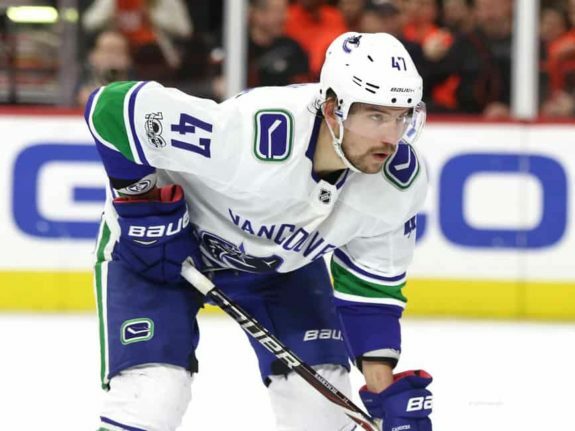 The Canucks third pairing will likely feature two Benning additions who have endured difficulty in Vancouver, Gudbranson and Michael Del Zotto. Look for Derrick Pouliot to play games sooner rather than later, perhaps supplanting Hutton in the line-up. Green already mentioned that he liked Pouliot with Gudbranson, so Del Zotto could find himself back on the second pairing as well. Aside from these seven stalwarts, the Canucks will also have Alex Biega sitting in the press box waiting for action. Jacob Markstrom finally got a chance to prove himself as a starting goalie last season. Green gave him the keys, and Markstrom hit the 60 game mark for the first time in his career. Two of Markstrom’s biggest problems last season: his glove hand, and his knack for giving up early goals. Both areas of his game improved as the season went on, and so did his overall stats. Markstrom was 10-13-4 with a .906 save percentage from October to December. From January onwards, Markstrom went 13-13-3 with a .917 save percentage. Part of the reason why Markstrom played so many games, is because the Canucks had zero faith in Anders Nilsson. People forget that he actually started strong, posting a 6-2-1 record with a .922 save percentage in October and November. After that, Nilsson was a putrid 1-12-1 with a .891 save percentage. Nilsson did finish off his season nicely – at the World Championships when he led Sweden to a gold medal. He wasn’t able to carry that success over to the preseason, but he’s got a fresh slate heading into the 2018-19 campaign. Not since Pavel Bure had a Canucks rookie exploded onto the scene like Boeser did last season. What should make Canucks fans most giddy above all else, is that Boeser’s performance might only be a precursor for what Pettersson might do. 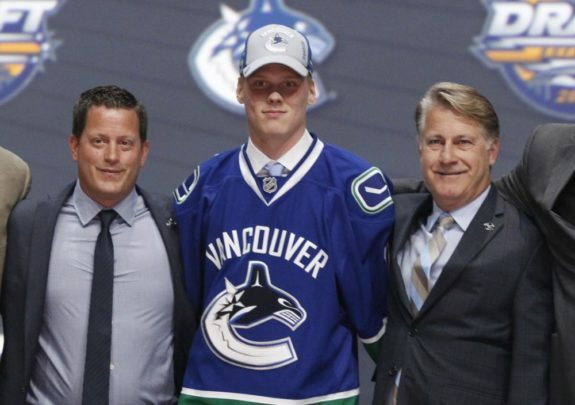 Expectations for Pettersson exceed that of Boeser’s from last season, and why shouldn’t they? After setting records in the SHL, all Pettersson did was play heads above every other Canuck during preseason action. 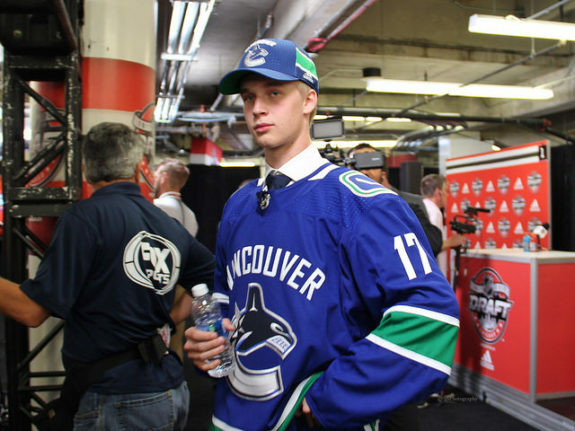 While most expected Pettersson to begin his NHL career on the wing, Green showed some moxie by line-up up the 19-year-old at centre from the first day of training camp onwards. It’s paid dividends in the preseason, where Pettersson displayed a well-rounded yet explosive game. Only 21 players have surpassed 60 points in their rookie season since the 2004 lockout. That includes Nicklas Backstrom, who’s 69 points rank tenth during that time. Pettersson outpaced Backstrom in the SHL, could he do the same in the NHL? While there’s one glaring breakout player to pinpoint on the Canucks, there are a plethora of players who have lots to prove. You could basically put two-thirds of the team into this category. I’m picking the one who arguably has the most upside: Nikolay Goldobin. His unreliable defensive play and pace irks Green, but Goldobin brings something that the Canucks utterly lack: someone with sublime hands and vision in the offensive zone. 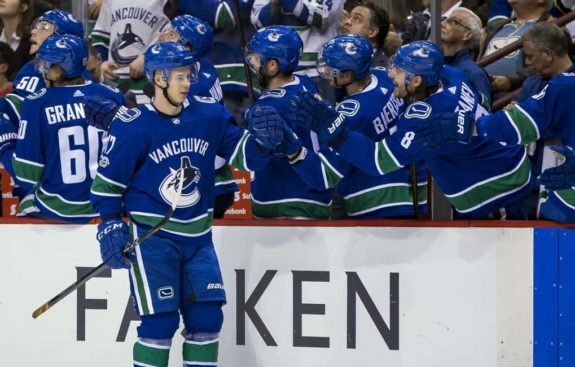 Pettersson and Goldobin displayed some evident chemistry during the preseason, and they should get a chance to showcase that together when the games matter. He’s more of a lock on the second line than Leipsic, who could be replaced by Eriksson. If you could define one player on the Canucks as one with “boom or bust potential,” that player is Goldobin. For the record, both Virtanen and Hutton fall firmly into this category as well. The Canucks have one of the league’s weaker teams in the NHL, but they have stocked their minor league team with options. Those options include four players who spent a combined 158 games with the Canucks last season. Gagner was the surprise cut from training camp, when he was waived in favour of Motte. In a perfect world, the Canucks won’t feel the need to call him up. It would be best for the team if the younger players proved worthy of spots, but that’s still heavily up for debate. The Canucks also have Reid Boucher, Brendan Gaunce and Darren Archibald in the minors. Archibald was the last cut from training camp, so he should have a leg up on Boucher or Gaunce. However, the forward likeliest to earn a call-up is Adam Gaudette. The signings on July 1st preemptively sealed his fate for making the team out of camp. Granted, Gaudette didn’t do much to force the team’s hand during preseason action. He should get a leading role for the promising Utica Comets. Jonathan Dahlen was one guy who got another decent look during the preseason but couldn’t capitalize after a strong showing at the Young Stars tournament. We will have to wait for the foreseeable future for the Canucks to see if Dahlen and Pettersson can rekindle their chemistry in the NHL. There are a bunch of other young forwards who could earn a call-up if they show well in the AHL. Kole Lind, Jonah Gadjovich, Petrus Palmu, and Lukas Jasek are all entering their first-full AHL campaigns, and they’ll have to battle for playing time in the minors before playing in the NHL. The Canucks traded Michael Chaput to the Chicago Blackhawks for Tanner Kero in the offseason. Zach MacEwen is another forward who had a good rookie season in the AHL and could slide into a fourth line role as well. Down in Utica, the Canucks have no shortage of options at forward. On defence, the Canucks don’t have nearly as many call-up options but there is one notable name that stands out. Olli Juolevi will officially begin his pro career in North America with the Utica Comets. While the performance of other 2016 first rounder had some questioning Juolevi, he did just turn 20 in May. By all reports, he finished strong in Finland and has looked good at the start of training camps in Utica. Benning wants Juolevi to play games in the NHL this season but like everyone else in the AHL, he’ll have to prove it. 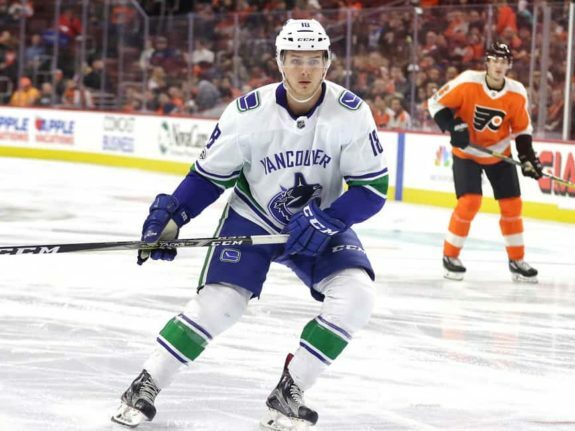 Ashton Sautner is another call-up option in the Canucks decide Juolevi isn’t ready. Sautner looked good in limited minutes with the Canucks last season. Evan McEneny is another name to watch. He earned a call-up during an impressive 2016-17 AHL season but battled injuries throughout 2017-18. The two other names to watch are Jalen Chatfield and Guillaume Brisebois. Management raised eyebrows by raving about the steady Brisebois last season, but he was sent to the AHL before Chatfield during training camp. No one predicts that the Canucks will challenge for a playoff spot this season. Green has been transparent about where the team is at, mentioning that it’s all about the young players progressing this year. That’s what needs to happen for the Canucks season to be a success and it starts at the top of their line-up. Boeser and Pettersson have a chance to be special, elite players. 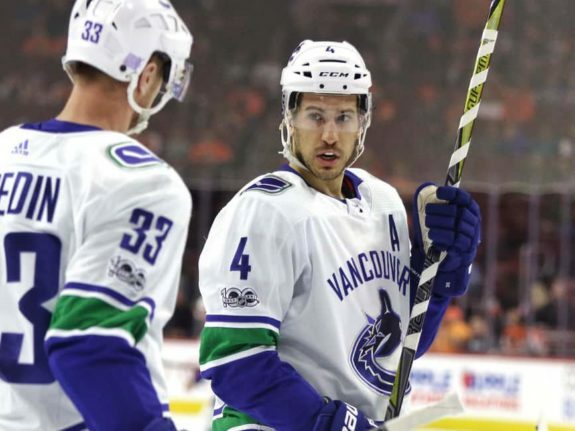 If they prove capable, it goes a long ways towards solving the Canucks scoring woes. There are also questions about Horvat, as he looks to continue proving that he’s a first line NHL centre. Can he stay healthy and surpass 60 points? The Canucks are also desperate for one of their other forwards to break out. 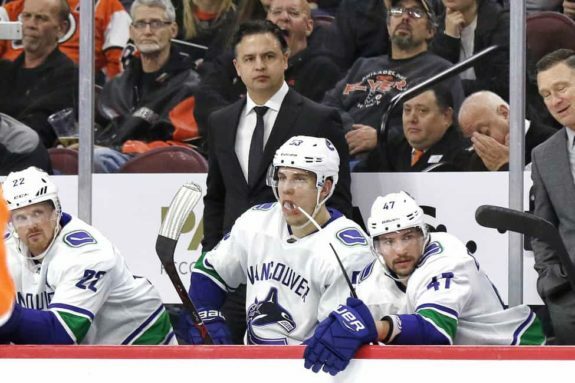 Whether that’s Goldobin, Leipsic, Virtanen, or even the beleaguered Eriksson, someone else will need to score goals to at least provide entertainment and hope. 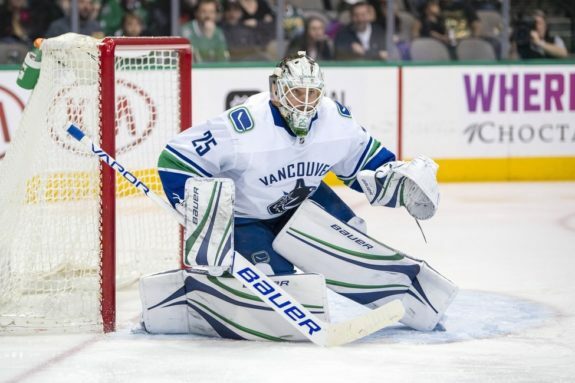 In goal, Markstrom should be constantly-motivated by the looming presence of Thatcher Demko. The crease is Markstrom’s for now, and he did show signs of improvement in the second half of the season. While there are holes all over the lineup, the biggest weakness is the blueline. The Canucks don’t have a top-two defenceman, and they’re perpetually a wreck when Tanev is out of the lineup. 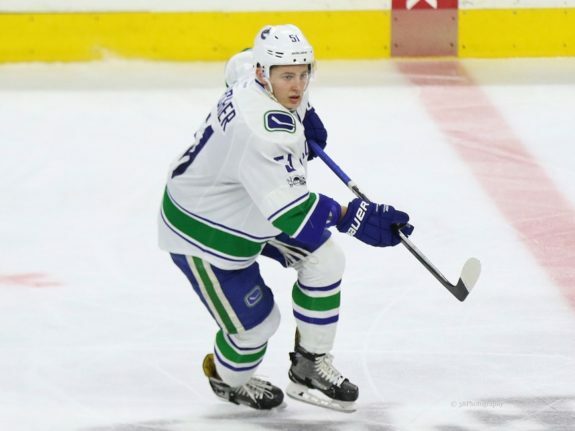 Stetcher provides more hope than anyone currently on the blueline, but the Canucks will once again struggle until their defence learns to score and prevent chances. 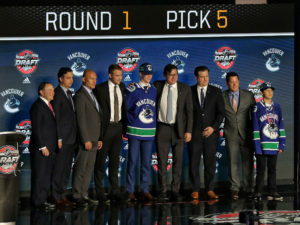 The most exciting day of the season might once again happen on June 21, 2019, when the NHL Draft takes place in Vancouver. A season of losing could put the Canucks in a position to draft a special player, whether that’s Jack Hughes or someone else. A combination of healthy improvement for Canucks in the NHL, an AHL team blossoming with you guys rushing for roster spots, and a stellar showing on draft day would epitomize a strong season for this basement-bound team. Oh, and Pettersson snagging the first Calder for the franchise since Bure. That would be alright as well.